Last week we payed homage to the Veganism with our Coconut Lentil soup. It’s now time to honour the simple and delicious Singaporean Laksa. Laksa is a deep bowl of delicious comfort. It always taste so amazing. 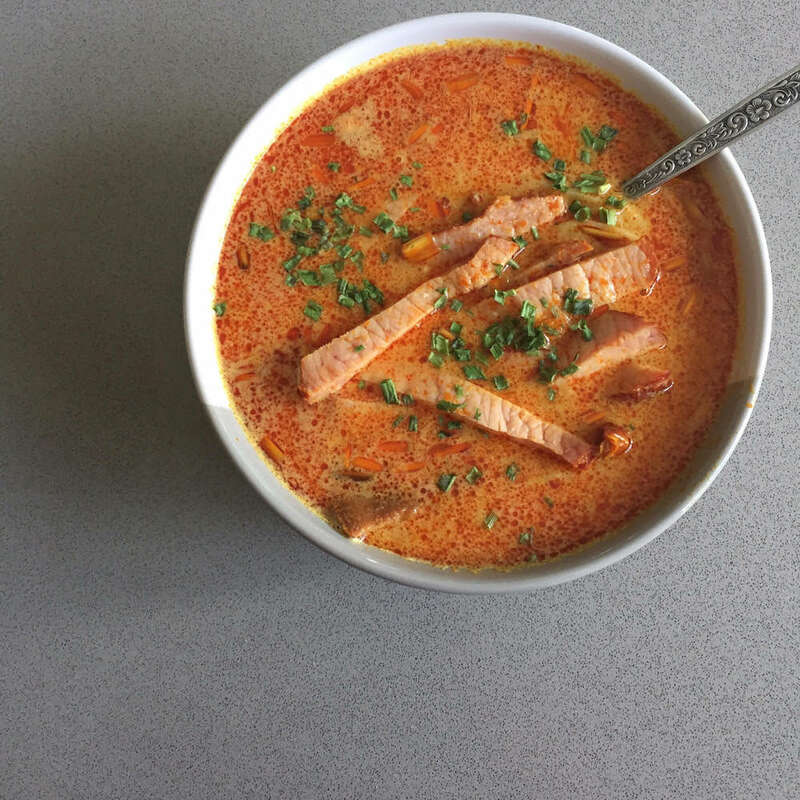 This Laksa recipe comes from Libby Elliot (@elizabethlouisenutrition), her Christmas twist uses smoked ham to add some protein to the dish. Serves one hearty meal or two lighter meals than are actually in the dish. But trust us, there won’t be any leftovers! Preheat your oven to 180 ℃. Place your pre cooked smoked ham in an oven-safe glass or ceramic baking dish big enough for your piece of meat. Add 1 to 2 inches of water to your baking dish (to prevent the ham from getting burned in the oven). Glaze the ham to give it flavour. There are many ways to glaze a pre cooked smoked ham: mixing brown sugar and crushed pineapple with its juice and pouring this on top or mixing equal parts honey and water and doing the same or use a cooking brush to brush your glaze over your ham if you want only a thin layer over it. Cover your pre cooked smoked ham with tin foil, wrapping the foil to the edges of your baking dish. If your baking dish doesn’t have edges, make the sheet of tin foil big enough to wrap over the ham and under the baking dish so it remains tightly sealed during the heating process. Place the covered ham in the oven and heat it for 10 minutes per pound of ham. This is an estimate, and your ham may take longer depending on your oven. Open the tin foil covering and cut into the meat to make sure it is heated all the way to the center, once your timer is done. Remove the ham from the oven and keep the foil covering intact until you are ready to serve so the meat remains hot. Fill a pot with 250 mL of water & Bring to the boil. Empty the contents of dried herbs and spices into the water & simmer for 2-3 minutes. Bring back to the boil & simmer for about 2 minutes. Meanwhile place the rice noodles in a separate bowl & add boiling water. Leave to sit for 3-4 minutes. Drain noodles. Add the Laksa paste & Coconut cream into the pot & stir well. Bring back to the boil. Add the cooked rice noodles into the pot and serve.